The first OPV in class, Viana do Castelo (P360), was commissioned into service in March 2011. Image: courtesy of Antonio da Silva Martins. The flight deck of Viana do Castelo-class can accommodate a single Super Lynx MK95 helicopter. Image: courtesy of Pedro Aragão. Viana do Castelo Class offshore patrol vessels (OPVs) are under construction for the Portuguese Navy. Being built by Estaleiros Navais de Viana do Castelo (ENVC) and West Sea Shipyards, the OPVs are primarily intended for operations in the waters of the North Atlantic Ocean. The vessels can be deployed in maritime patrol and surveillance, fisheries protection, search-and-rescue (SAR), drug trafficking, illegal immigration, arms trafficking, disaster relief and environmental protection missions. The OPVs are named after the coastal cities of Portugal. The first ship, Viana do Castelo (P360), was launched in October 2005 and commissioned in March 2011. 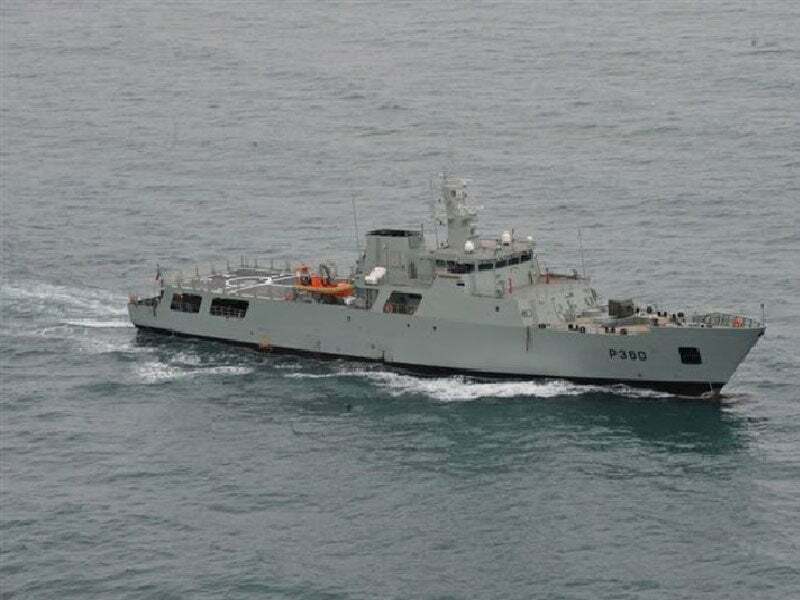 The second vessel, Figueira da Foz (P361), was introduced by ENVC in October 2005 and was enlisted in June 2013. Portugal signed a $84m contract with the CWSE-NPO consortium comprising West Sea and EDISOFT, a subsidiary of Thales, for the construction of additional vessels in July 2015. The construction programme of the third OPV, Sines (P362), and three more vessels in the class, was announced in 2016. The Sines OPV was launched by West Sea Shipyards in May this year and is scheduled for commissioning in June 2018. Setubal, Funchal and Aveiro, the remaining vessels in the class, are currently under construction at West Sea Shipyards. The Setubal OPV is scheduled to be delivered to the Portuguese Navy by December 2018. The OPV features a mono-hull design incorporating an integrated platform management system (IPMS), navigation, integrated data, and aircraft visual aids system. The vessels can support the operations of unmanned systems and are installed with a Sagem SA Vigy 10 MKIII naval surveillance and observation system, three water cannons, and two rigid inflatable boats (RIBs). Anti-pollution variants with fat oil recovery systems are fitted on the vessel to collect and transfer the pollutants spilled in the ocean. The onboard storage tanks allow for the storage and heating of the collected contaminated materials to extract the pollutants. "The vessels can support the operations of unmanned systems and are installed with a Sagem SA Vigy 10 MKIII naval surveillance and observation system, three water cannons, and two rigid inflatable boats (RIBs)." The OPV has a length of 83m, beam of 12.9m and a draft of 3.8m. The full-load displacement is 1,850t. Each vessel can accommodate a total of 42 personnel. The OPV is armed with a 30mm Oto Melara Marlin gun and two 7.62 mm light machine gun mounts. It is also installed with two launching systems for laying MK55 Mod 2 mines. The 30mm main gun has a 120 rounds a minute maximum rate of fire and can engage surface targets within a range of 6,000m, and aerial targets within 4,000m. The OPVs are equipped with a flight deck at the stern of the hull. The deck can support the operation of a single medium-sized helicopter such as Super Lynx MK95 helicopter. The vessel, however, lacks hangar facility. The OPVs are powered by diesel-electric propulsion, integrating two Wartsila diesel engines and two electric motors that drive two five-bladed, variable-pitch propellers. Each diesel engine develops a power output of 3,900kW, while each motor develops a maximum power of 200kW. The propulsion system will provide a maximum speed of 20kt and a range of 5,000nmi at an economical speed of 15kt. This project forms part of our recent analysis and forecasts of the global Naval Surface Combatants and Warfare Systems Market available from our business information platform ‘Strategic Defence Intelligence’. For more information click here or contact us: EMEA: +44 (0) 20 7936 6783; Americas: +1 (0)415 439 4914; Asia Pacific: +61 (0)2 9947 9709, or via email.